A basic gore, or panel, made by the pattern we just drafted. It just doesn’t look like a modern gored skirt. Our pattern piece, on the other hand, looks exactly like a piece from a modern gored skirt pattern. I mean, there’s no two ways about that, unless we…. 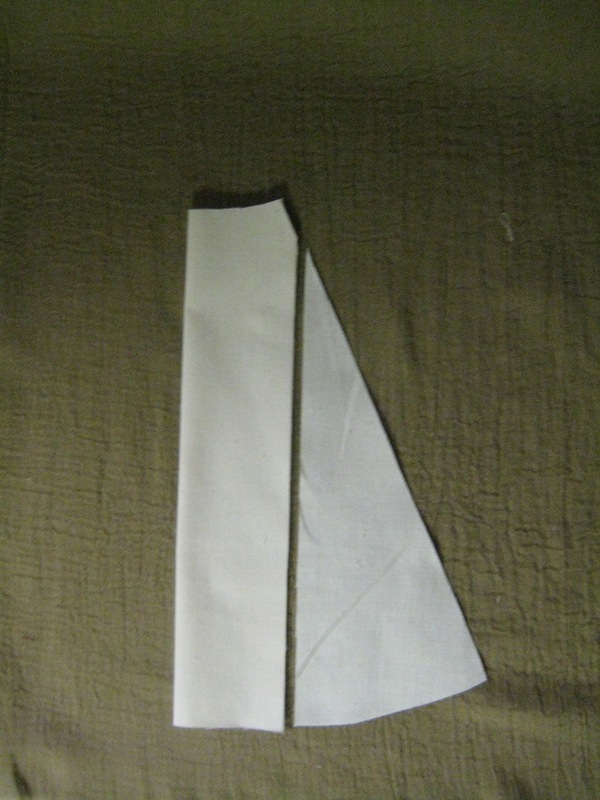 Fold it in half and chop off the sides a little below the waist. See the side gore? Hack it in two, starting a little below the tip (shown at right). We're starting our cut below the tip so that the resulting joins are staggered. 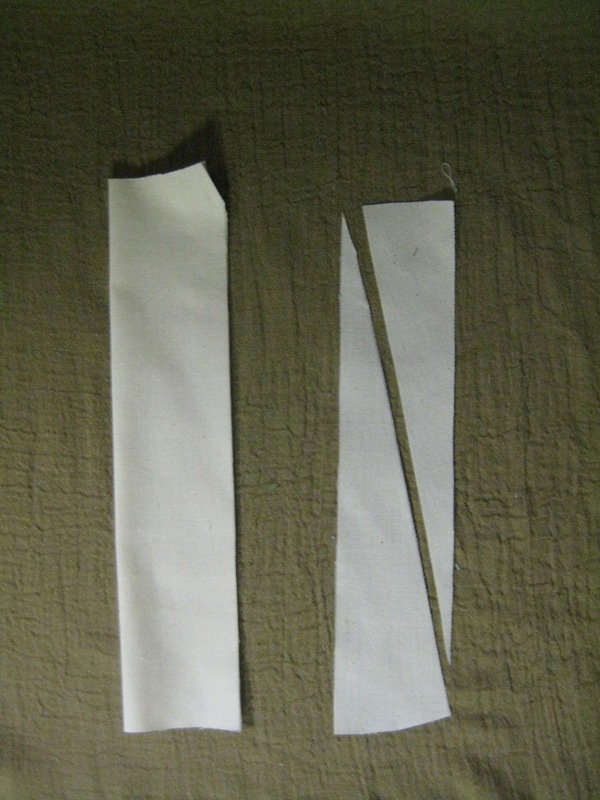 Flip the smaller side gore over, so the two triangles form a rectangle. Well, you know, that does look somewhat familiar…. This is the extremely fabric-efficient way to pattern and cut a gore, especially if you’re stuck working with 22″ fabric. It works out well for fabrics that look kinda the same right side up and upside down and front to back (because the pieces get flipped round), so that you can save money making your support skirt. You wouldn’t do this on, say, a ludicrously expensive venetian silk brocade, because all those lines would really mess up the pattern and we’d be back to where we were before the waist seam, but now with an extra seam at the waist. That would be silly. So, I hope you’ve learned a thing or two about the how-tos and where-fores of skirt patterning, and that you’re still glad you started reading this monster. 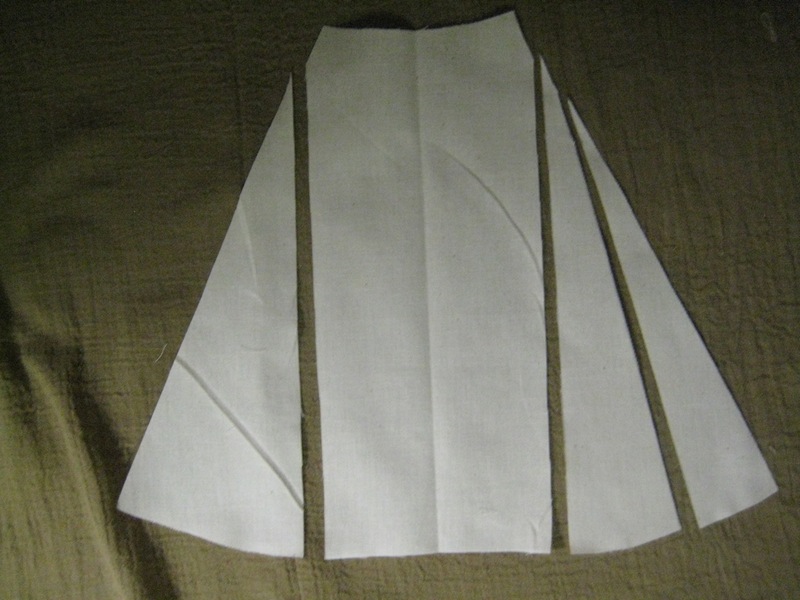 All skirts come from one of these three basic cutting plans, and now you know how to make them all. Throughout history, the only thing that really changes is how much fabric is in the skirts, how curvy the gores are, and whether the skirt itself is suspended from the waist of the wearer or attached to the body of the gown (usually it’s the later, incidentally.) That’s it. Funny how much there is to say about something this awe-inspiringly simple, isn’t it? 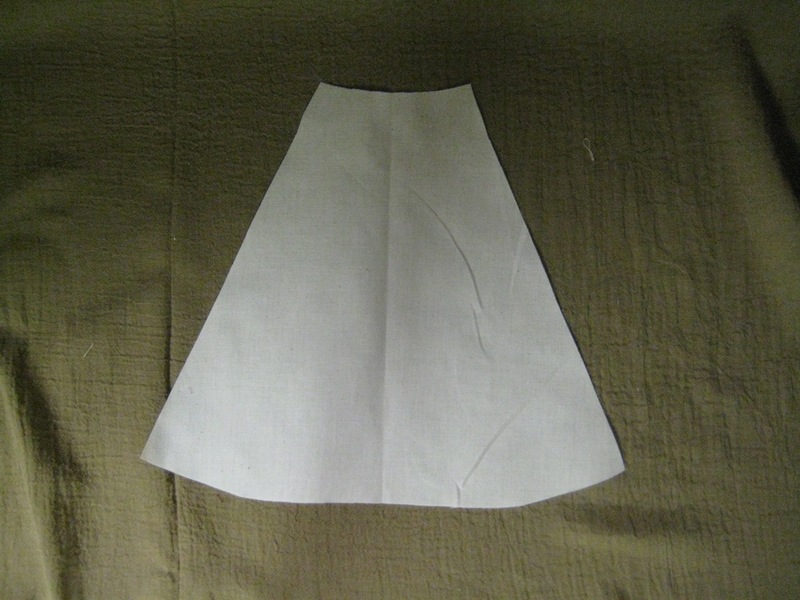 Next How do you Reproduce the Alcega Farthingale Pattern? Wonderful tutorial! It explains so much to me! Such as: why the skirt on my first Irish dress, while simple to make with its rectangle skirt panel, look awful when I wore it! Thank you for yet another incredibly fabulous tutorial!!!! Thanks, Irmgard – you’re totally right. There are regions and eras that do go back to the rectangular cut. (The Pompadour styles are my fav example. There are gored examples, but the height of the era makes amazing use of rectangle skirts and an extremely sophisticated bodice cut to make that back-that-flows-from-the-shoulders look work.) I think it’s fair to say that no one in the 1500s too advantage of the gore for a totally smooth, controlled skirt like the Spanish. The rest of Europe started to put far more fabric into the tops of their gores. I’ve followed your site for some years, and I really enjoy your writing style – and being prone to perfectionism, I appreciate your healthy attitude to research vs cutting corners! Can relate to the sewing/programmer background too. I love the idea of historical style clothing, though unfortunately I can’t see a place for it in my life at the moment. I based gowns for my wedding and MSc degree ceremony on designs in Patterns of Fashion 2, and they really made me feel very special! This post is just wonderful. I found your site when researching patterning and I am so glad I did! I appreciate the passion you have for the art of clothing and the evolution of fashion aesthetic. I hope your web store will be up soon so I can check out your e-books.